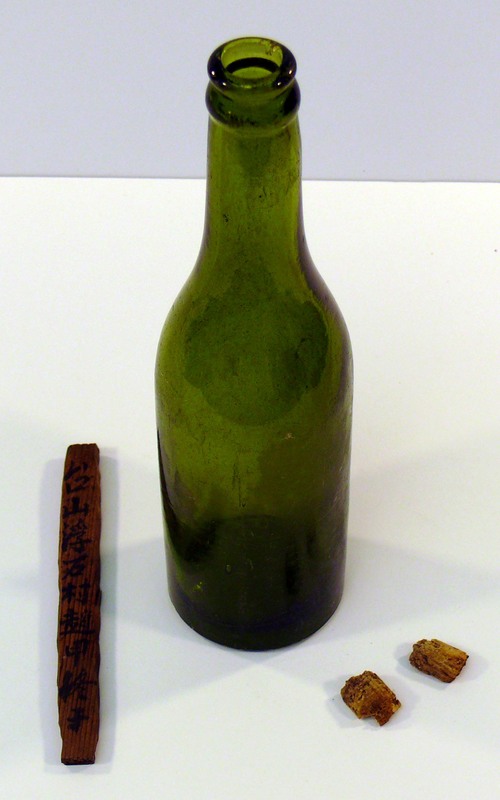 CM 1747 Bottle (Grave Marker) Green glass bottle; crown top; 2 piece of cork and wooden marker inside bottle; wooden marker shows Chinese characters on both sides. Original museum documentation states: 2 bottles [including CM 1746] containing Chinese grave markers found in Chinese Cemetery on Little Mountain August 30, 1982. Found by Mr. Ganton; member of I.O.O.F. Cemetery Board; were buried with bodies only a few bones remaining. IOOF - Independent Order of Odd Fellows.